Coveted Aruba model built by US Homes in magnificent Marbella. 1703 sf. 2BR/2BA PLUS DEN!! Expanded screened Lanai with Spa and landscaped in-ground pond with fountain feature, plus covered entertainment area. Well-kept, clean, light and bright with 10' ceilings, crown molding, ceiling fans and ceramic tile in all but 2nd BR and Den. Living Room has beautiful, custom built-ins, as does the Den. L-shaped Dining Room has direct access to the sunny white-on-white kitchen and Breakfast Room. Master has two walk-in closets, plant shelf, and sliding glass doors with direct access to the Lanai. Master Bath has separate shower plus Garden tub, dual sink vanity and private water closet. 2nd Bath features a single sink vanity with shower. Inside Utility with Washer, Dryer and cabinetry. Roomy 2-car garage with attic access and some storage cabinetry. 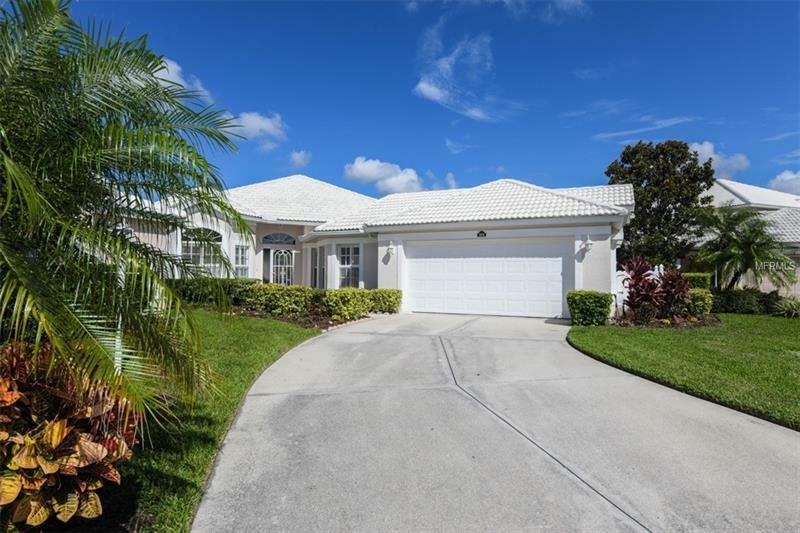 This home beckons a new owner who desires a well-maintained, gated neighborhood, with friendly neighbors, quiet space and tranquil views. Legacy Trail is just around the corner. Easy access to I-75. Nearby shopping, dining, medical facilities, YMCA and Prestancia's TPC golf courses. 15 minutes to world-famous Siesta Key Beach or downtown Sarasota. Don't miss this great value now available in beautiful Palmer Ranch. Copyright © 2019 Mid Florida MLS. All rights reserved. The data relating to real estate for sale on this web site comes in part from the Internet Data Exchange Program of Mid Florida MLS. Information provided is for consumer's personal, non-commercial use and may not be used for any purpose other than to identify prospective properties consumers may be interested in purchasing. RE/Max Alliance Group participates in the MFRMLS Internet Data Exchange (IDX) program, allowing display of other MFRMLS broker's listings on this site. However may not include all listings currently available. Information is deemed reliable but not guaranteed. Information last updated at 2019-04-23 20:55:38.